New York-based pharma giant Pfizer sold US$5bn of new corporate bonds Monday in five parts, as the company contributes to a groundswell of issuance amid low U.S. interest rates. 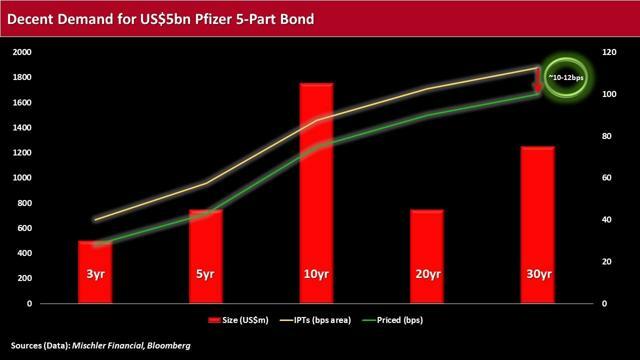 Pfizer was one of several investment-grade corporate bond issuers to take advantage of the still ultra-low U.S. interest rate landscape to bring new deals to market. A total of nearly US$15bn of fresh high-grade corporate debt priced, including a long list of financial and industrial deals. Meanwhile, pharmaceutical companies have been generally employing M&A to combat expiring brand-name drug patents, as well as to bolster innovation as technology advances. New York-based pharma giant Pfizer (NYSE: PFE) sold US$5bn of new corporate bonds Monday in five parts, as the company contributes to a groundswell of issuance amid low U.S. interest rates. The senior unsecured deal, comprised of maturities ranging from two- to 30-years, attracted decent demand, with spreads on the tranches having compressed anywhere between 10-12bps over the course of their pricing evolution. It appears most investors’ interest was centered on the shorter-dated notes, likely due to the sensitivity of interest rate risk in the longer end of the maturity spectrum. Pfizer said it will peg proceeds from the sale for general corporate purposes, including to refinance, redeem or repurchase existing debt and to repay a portion of its outstanding commercial paper. The deal, rated ‘A1’ by Moody’s Investors Service and ‘AA’ by Standard & Poor’s, was jointly lead-managed by Barclays Capital, Deutsche Bank Securities, Goldman Sachs and J.P. Morgan Securities. 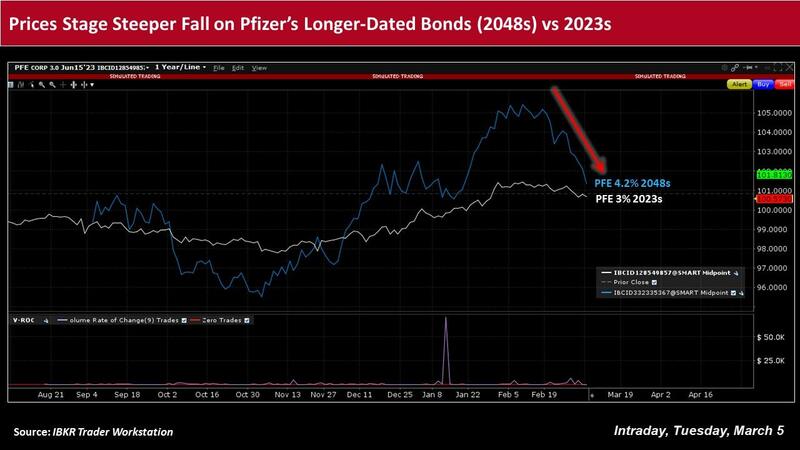 Moody's said its ‘A1’ credit rating on the transaction partly reflects Pfizer’s “conservative capital structure,” with nearly US$20bn of cash and investments and gross debt/EBITDA of under 3.0x, including a large U.S. tax liability on foreign earnings. He added that many Pfizer products are “off-patent and declining, grouped into the newly named ‘Established Medicines’ business,” and there is event risk related to both business separations, as well as large acquisitions. Pharmaceutical companies have been generally employing M&A to combat expiring brand-name drug patents, as well as to bolster innovation as technology advances. In mid-December, Pfizer and British pharma GlaxoSmithKline (NYSE: GSK), for example, agreed to form a joint venture, effectively establishing the largest global consumer healthcare business, with a focus on pain relief, respiratory, vitamin and mineral supplements, digestive health, skin health and therapeutic oral health. Under the terms of the transaction, Pfizer will receive a 32% equity stake in the JV, with GlaxoSmithKline the remaining 68%. 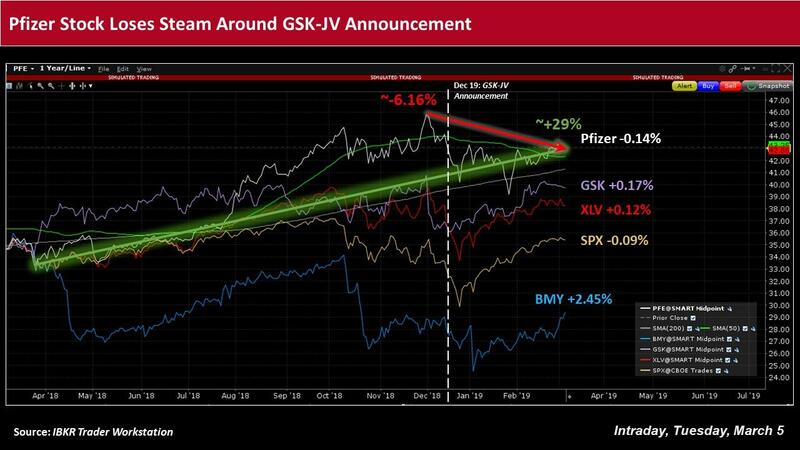 The companies expect the transaction to fetch US$650m in peak cost synergies and to be slightly accretive for Pfizer in each of the first three years after the close of the transaction, which is anticipated during the second half of 2019, subject to GSK shareholder approval and regulatory approvals, as well as other customary closing conditions. Elsewhere, Bristol-Myers Squibb (NYSE: BMY) also recently agreed to swallow-up cancer treatment giant Celgene Corp (NASDAQ: CELG) for an estimated US$74bn to bolster its cancer-fighting efforts. The combined company is slated to have nine products, with the potential to generate more than US$1bn in annual sales, as well as growth in the core disease areas of oncology, immunology and inflammation and cardiovascular disease. Among other touted benefits, the merged entity will also gain expanded innovation capabilities in small molecule design, biologics/synthetic biologics, protein homeostasis, antibody engineering and cell therapy. Also, in January 2018, Celgene agreed to acquire Seattle-based biopharma company Juno Therapeutics (NASDAQ: JUNO) for about US$9bn to boost its cancer treatment program. The combinations seem to agree with the recent trend of pharma-related M&A, which some analysts expect to continue, amid tax incentives, as well as critical operational strategies. While it can be challenging to accurately pinpoint patent-expiration dates, McKinsey suggests the total value of revenues at risk from patent expiries over the next three years, for the top 25 pharmaceutical companies, is roughly US$85bn. GlaxoSmithKline, for instance, intends to separate its JV with Pfizer as an independent company via a demerger of its equity interest to its shareholders and a listing of the Consumer Healthcare business on the UK equity market. The British pharma may also sell all or part of its stake in the joint venture in a contemporaneous IPO. Meanwhile, Pfizer was one of several investment-grade corporate bond issuers Monday to take advantage of the still ultra-low U.S. interest rate landscape to bring new deals to market. 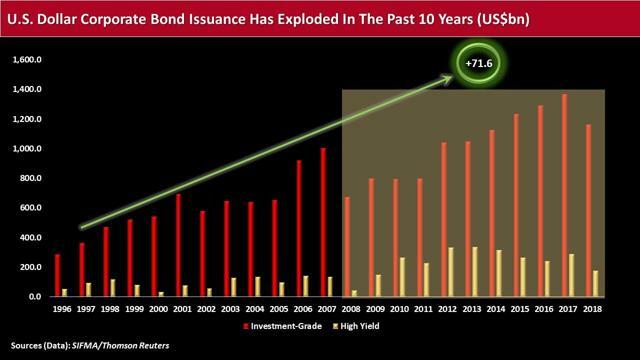 A total of nearly US$15bn of fresh high-grade corporate debt priced, including a long list of financial and industrial deals such as HSBC Holdings’ US$3bn two-part bond, MUFG Union Bank’s US$1.3bn note in two parts, and John Deere Capital Corp’s US$1.5bn three-part bond. The issuance also continues to see healthy demand, in large part as improvements in the U.S. economy have been helping lure investors to the yield offered in the primary market – especially those buyers who have been priced out of their local markets or have a dearth of available paper. The yields on 10-year Japanese and German government bonds were last in the area of -0.002% and 0.166%, respectively, while the yield on the 10-year U.S. Treasury note was last around 2.740%. With risk appetite generally intact, amid recent reports of progress on U.S.-China trade negotiations, as well as the Federal Reserve’s patient stance on monetary policy changes, inflows into corporate bond and equity funds continue to swell. Analysts at Janney Montgomery highlighted that fund flows in the latest week remained concentrated in the U.S. market, as international and global debt funds recorded outflows. They added that investors are also looking at the shorter end of the curve, with almost US$7.6bn entering money market funds. Janney Montgomery added that average absolute yields of corporate, mortgages, and other risk assets have fallen in recent weeks to reflect the heightened demand. For the week ended February 27, Thomson Reuters/Lipper U.S. Fund Flows reported a net inflow of roughly US$3.9bn into investment-grade corporate bond funds – the largest weekly inflow in over a year – while high yield funds reported net inflows of US$698m. Emerging market equity funds also saw US$95m of inflows, providing further evidence of heightened risk appetite. Against this backdrop, the U.S. investment-grade corporate primary market is likely to continue to churn out deals, especially if market conditions continue to support the rosy risk-taking tone. Syndicate managers generally expect a total of around US$28bn of new offerings in the week ending March 8, with nearly US$119.5bn anticipated in March. To date in 2019, a little more than US$232bn of new U.S. dollar-denominated issuance priced. Note: This material was originally published on IBKR Traders' Insight on March 5, 2019. Disclosure: I/we have no positions in any stocks mentioned, and no plans to initiate any positions within the next 72 hours. Business relationship disclosure: I am receiving compensation from my employer to produce this material.